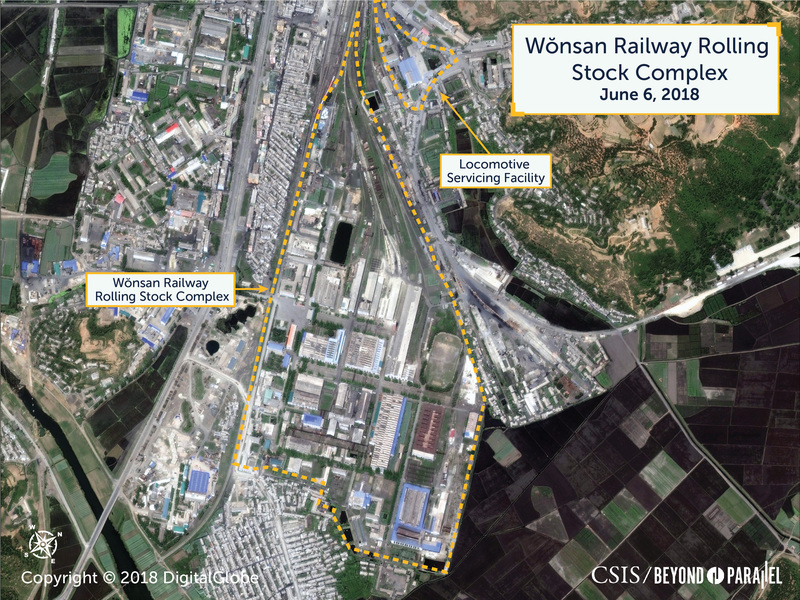 Activity around Wonsan is likely to be a leading indication of inter-Korean joint declaration progress given its role both in the eastern transportation corridor and the national economy. Wonsan Railway Rolling Stock Complex is the largest manufacturing and repair facility for railcars in the nation. Analysis of this facility can be a brick-and-mortar signpost of foundational infrastructure progress if rapprochement leads to new opportunities for infrastructure development. Railroads and railway facilities serve as the vital link underpinning North Korea’s underdeveloped economy. Together they present both new possibilities for inter-Korean relations and regional economic cooperation and foundational infrastructure for future unification. However, knowledge of North Korea’s infrastructure is lacking, according to a pilot survey of regional experts conducted by CSIS Beyond Parallel. 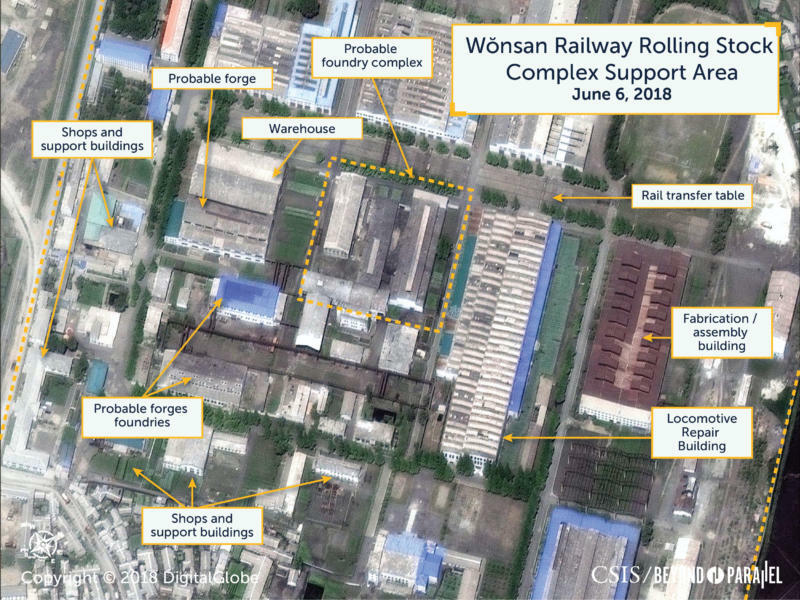 This study of North Korea’s Wonsan Railway Rolling Stock Complex builds upon our previous report of the Chongjin Railway Factory and together these reports begin to address that void. Commercial satellite imagery shows that the Wonsan Railway Rolling Stock Complex is currently active and appears to be well maintained by North Korean standards. In addition to its production and repair responsibilities, the complex serves as a center for North Korean railroad technical research and development. 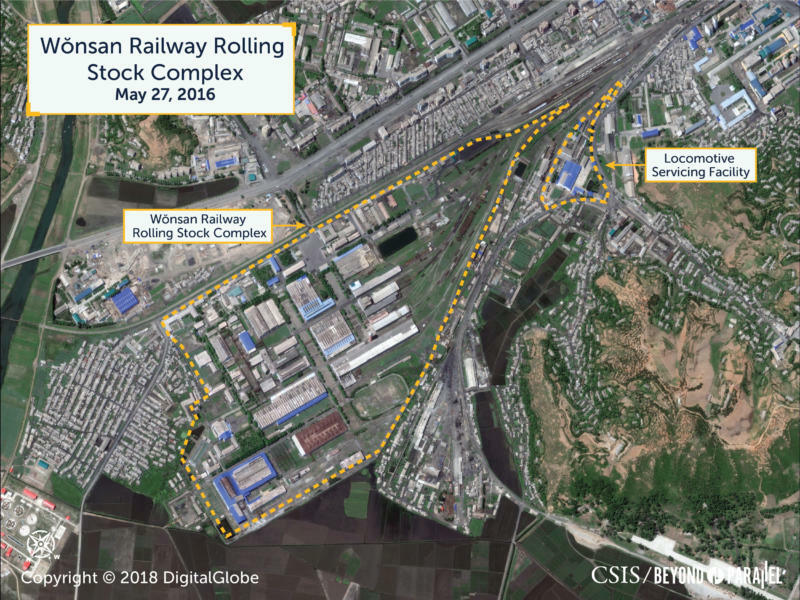 Despite being eclipsed in recent news by the tourist zone development, the Wonsan Railway Rolling Stock Complex plays an important role in the city as well as in the regional and national economies. As efforts progress to modernize and reconnect the eastern transportation corridor between North and South Korea under the April 27 Panmunjeom Declaration, a joint declaration for peace, prosperity, and unification, the railcars produced and serviced at the complex could play an increasingly important role. 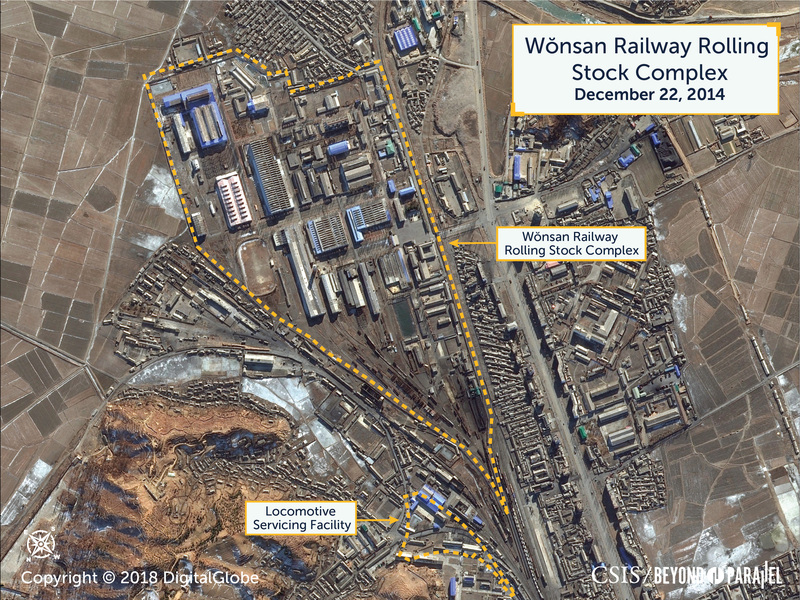 The Wonsan Rolling Stock Complex is one of just five major industrial facilities that undertake railcar production and depot-level repairs for the nationwide network. Recent imagery courtesy of Digital Globe. Located in the southern section of the port city of Wonsan, Kangwon Province, adjacent to the Kalma Rail Station, the Wonsan Railway Rolling Stock Complex (39.140053 127.475910) manufactures and repairs railway rolling stock; repairs steam, diesel, and electric locomotives; and produces railcar and locomotive components and sub-systems. As of June 2018, commercial satellite imagery shows that the complex is active and appears well maintained by North Korean standards. The complex encompasses an irregular-shaped, fenced-in area of approximately 540,000 m2 (133 acres) and can be broken down into three functional areas: administration, engineering, and support; manufacturing and repair; and rail yard. The administrative facilities are generally concentrated along the southwest side of the complex. The manufacturing and repair facilities occupy the center of the complexmost notably 10 large assembly, repair, and fabrication halls. These halls are connected by two rail transfer tablesthe largest being approximately 420-meters-longthat move heavy parts, subassemblies, and railcars from building to building or between bays in the same building. The engineering and support facilities (fabrication shops, forges/foundries, sheds, greenhouse, miscellaneous structures) are located along the northwest side and south-central section of the facility. 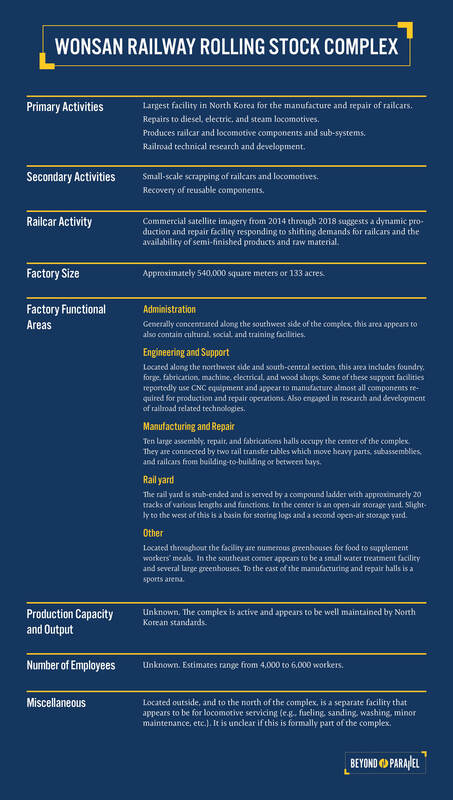 These support facilities reportedly use some computer numerically controlled (CNC) equipment and appear to manufacture almost all the components (e.g., road wheels, trucks, springs, couplers) from both semi-finished components and raw materials required for production and repair operations.9 On the north side of this section is a basin used for storing logs before they are brought into the adjacent woodworking shop. There are also several greenhouses located around the complex and what appears to be a water treatment plant in the southeast corner. The rail yard is stub-ended and is served by a compound ladder with approximately 20 tracks of various lengths and functions (e.g., shipping, receiving, holding, classification). In the center of the rail yard is an open-air storage yard. Immediately north of the complex is a separate facility that appears to be for locomotive servicing (e.g., fueling, sanding, washing, minor maintenance). It is unclear if this is formally part of the complex. Commercial satellite imagery from 2014 through 2018 shows that the total number of railcars observed at the complex has varied from a high of 88 on December 22, 2014, to a low of 59 on June 6, 2018 (these numbers include the adjacent engine servicing facility).10 This should not necessarily be taken as an indication of slowing output at the complex as each image examined for this report shows both significant differences in the numbers and types of railcars present and their positioning within the facility. Instead, this suggests a dynamic production and repair facility responding to shifting demands for rolling stock and the availability of semi-finished products and raw material. For example, among the railcars present in a December 2014 image were approximately 29 ore cars/gondolas, 12 boxcars, and 28 passenger cars. 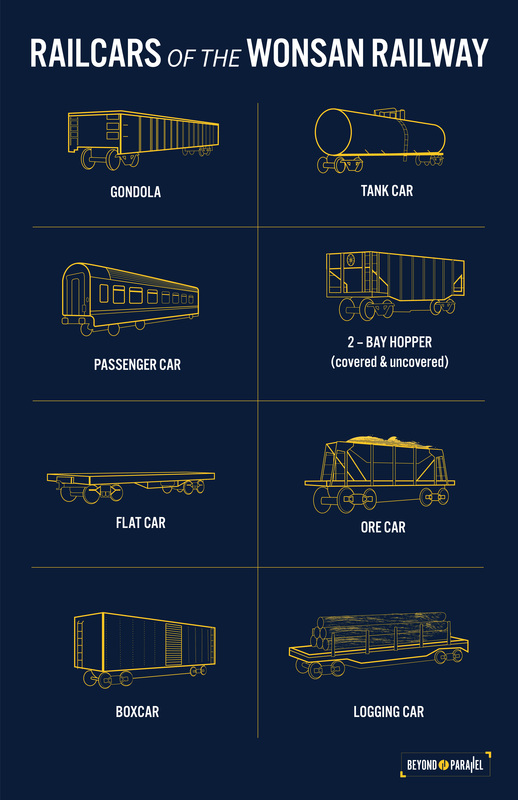 In a June 2018 image there were approximately 17 ore cars/gondolas, 22 boxcars, and 9 passenger cars. 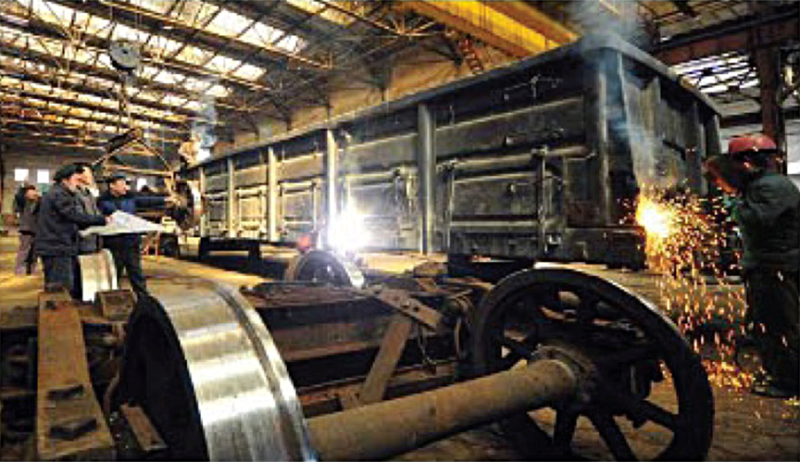 As railcar production and repair are heavily dependent upon steel, and to a lesser degree upon iron and aluminum, fluctuations in the supply of these materials undoubtedly affect the output at the Wonsan Railway Rolling Stock Complex. 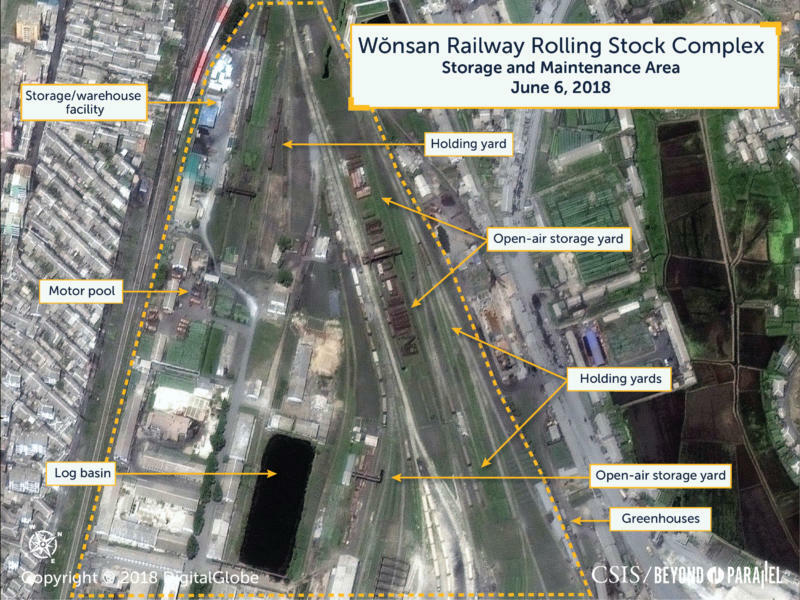 None of the North Korean media ground imagery reviewed for this report shows either modern manufacturing equipment or techniques employed at the Wonsan Railway Rolling Stock Complex. Therefore, the production output is likely significantly lower in quantity and quality to similar-sized facilities in Asia or the West. Additionally, this ground imagery shows a facility that is in need of significant infrastructure maintenance and numerous unaddressed safety issues. Should foreign financial investment be directed to the complex in the future, a substantial amount will likely be absorbed in addressing these issues before any meaningful profit be realized. Obvious in summer or fall imagery of the complex is that a significant portion of all open spaces is being used for gardening. Such gardening is typical of large industrial facilities in North Korea; however, unlike the Chongjin Railway Factory, the tracks at the Wonsan Railway Rolling Stock Complex are generally well maintained, ballasted, and relatively clear of gardening activity, indicating active use. 3. Central Intelligence Agency, "CIA Facebook: Korea, North," https://www.cia.gov/library/publications/the-world-factbook/geos/kn.html, accessed April 25, 2018; and Chiang Hsun, "Hong Kong Businessman Breaks Bottleneck of China-North Korea Railway Transportation," Yazhou Zhoukan, October 2005, No. 44, http://www.yzzk.com. 4. Dormels, "North Korea's Cities." 5. "New Heavy-duty Wagon Manufactured in DPRK," KCNA, December 1, 2016; and Namgung Yong, North Korea's Industrial Infrastructure(Seoul: North Korea Research Team), Research Report No. 94-05, February 26, 1996. 6. Scientists and technicians from the complex have mentioned numerous times in North Korean media. For example, KCNA, December 15, 2017; Palmyo'ng Kongbo, October 5, 2005, 41; Kisul Hyo'ksin, November 5, 2005, 23; Palmyo'ng Kongbo, July 5, 2005, 52; Kisul Hyo'ksin, July 5, 2005, 36; and Kisul Hyo'ksin, March 5, 2005, 14. 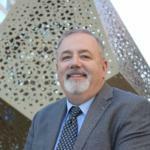 The facility's technical achievements have been noted since then. For example, Ji Nam Il, Sim Hyon Jin, and Pang Un Hye, "Nation's Arterial Industry in Good Maintenance," Korea Today, Juche 108, No. 4, April 2009 and KCTV, May 2, 2018. 7. For example, KCNA, January 19, 2007; KCTV, November 26, 2002; and KCBS, October 23, 2002. 9. "Kangwon Province of DPRK Hastens Economic Construction," KCNA, July 2016. 10. These numbers should be viewed as approximations as they only count the railcars present within the complex and engine servicing facility, not the adjacent Kalma Rail Station and holding yard. Additionally, the numbers do not account for the limited number of satellite images reviewed or seasonality. A more comprehensive study would likely provide a more nuanced understanding and reveal an explanation for the apparent decline. Subordinate to North Korea’s Ministry of Railways are five major industrial facilities involved in the production and depot-level repair of rail cars and locomotives. 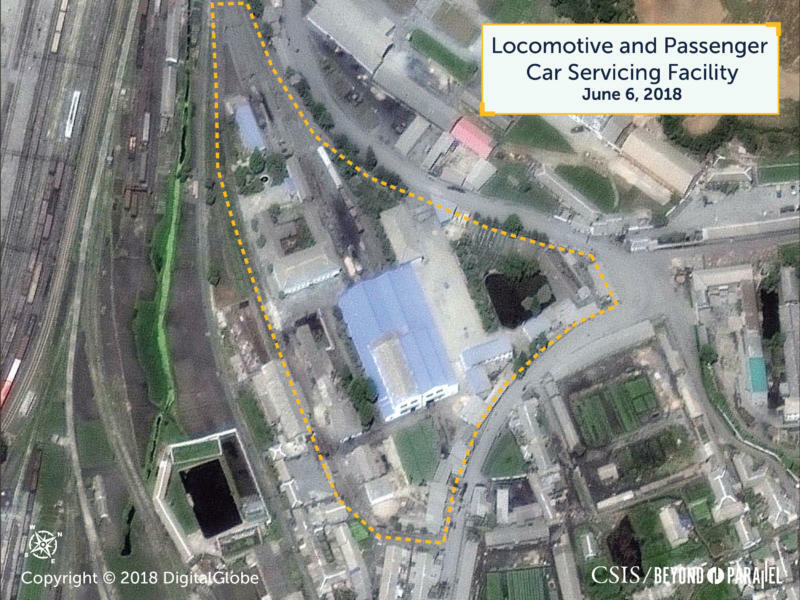 Subordinate to North Korea’s Ministry of Railways are five major industrial facilities involved in the production and depot-level repair of rail cars and locomotives. These facilities are the 6 July Railway Factory, Chongjin Railway Factory, Kim Chong-tae Electric Locomotive Works, Pyongyang Rolling Stock Repair Plant, and Wonsan Railway Rolling Stock Complex. Reflecting a general geographic division of the nation into east and west coasts caused by north-south mountain ranges, two of these—the Kim Chong-tae Electric Locomotive Works and Pyongyang Rolling Stock Repair Plant—are located on the west coast in Pyongyang, and three are located on the east coast—6 July Railway Factory, Chongjin Railway Factory, and Wonsan Railway Rolling Stock Complex. The Ministry of Railways also exercises control over the rail network including research and development, education and training, security, railroad operations, acquisition, and production. 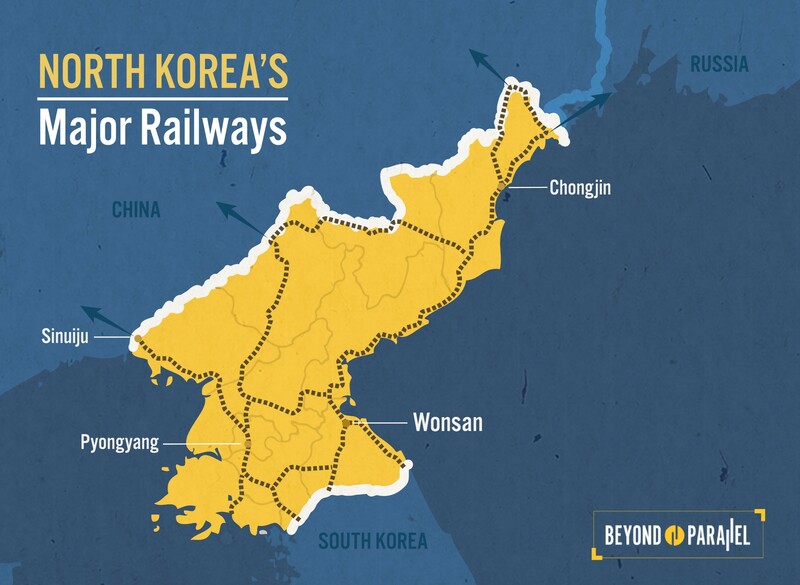 The Korean State Railway conducts rail operations through at least six regional bureaus—Chongjin, Hamhung, Kaechon, Pyongyang, Naseon, and Sariwon. Subordinate to these regional rail bureaus are more than 20 secondary repair shops and 50 engine houses located along the rail network throughout the nation that undertake minor repairs and routine maintenance. The Wonsan Railway Rolling Stock Complex is believed to be directly subordinate to the Ministry of Railways; however, its location in Wonsan means that it works closely with the Wonsan Railway Bureau. Previous names for the Wonsan Railway Rolling Stock Complex have included the KaIma Railroad Plant, Wonsan Railroad Factory, and 4 June Rolling Stock Works (sometimes referred to in English as the 4 June Rolling-Stock Works, June 4 General Rolling-Stock Works, or Wŏnsan Railroad Car Manufacturing and Rolling Stock Repair Plant). Today the complex is sometimes referred to in English as the Wonsan Railroad Car Manufacturing and Rolling Stock Repair Plant or Wo'san Railway Rolling Stock Complex. 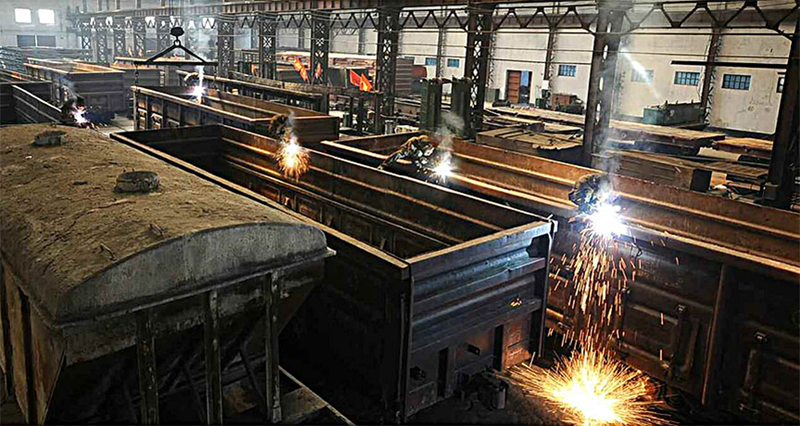 Source(s): Picture - Manufacturing operations for ore cars inside an assembly hall at the Wonsan Railway Rolling Stock Complex. A two-axle rail truck is seen in the foreground. (Rodong Sinmun, March 15, 2017), 11. Part 1 Chongjin report, 12. For example, “Overflowing with conviction to powerfully wage an all-out assault and brilliantly conclude this year's battle,” Rodong Sinmun, October 15, 2012, 4; “Pyongyang Rolling Stock Repair Plant,” KCBS, November 27, 2007; Hwang Myo'ng-hu'i, “Level Arm Tower Crane Produced at the Pyongyang Elevator Factory,” Rodong Sinmun, October 6, 2005, 5; Yi Kyong-hwa, “Blow the Whistle of Innovation High for a Turnaround in the Railway Transport!,” Rodong Sinmun, May 11, 1999, 3; and “Day of Railway Workers,” KCNA, May 11, 1998. There are numerous English-language variations for the names for these five facilities. Among the more common are Kim Chong-T'ae Electric Locomotive General Enterprise, Kim Chong-t'ae General Electric Locomotive Works, Kim Jong Thae General Electric Locomotive Works, June 4 General Rolling-Stock Works, 6 July General Railway Factory, July 6 General Railway Factory, 7.6 Vehicle Parts Factory, and the Pyongyang Rolling Stock Repair Works., 13. The Naseon Railway Bureau is sometimes identified by its older name of Najin Railway Bureau. The KPA and Guard Command exercise some level of control over rail operations that involve the rail movements of Kim Jong-un or military cargos. Author interview data; Oh Jae-hwan, “Security Agencies of North Korea under the Kim Jong Un Regime,” Korean Journal of Defense Analysis, Vol. 26, No. 1, March 2014, 117–131., “Trip Report North Korea October 2004,” accessed January 4, 2009, Kim Chong-min. “The Real State of North Korea's Military Roads and Transportation Equipment,” Pukhan, November 1997, 121–133. 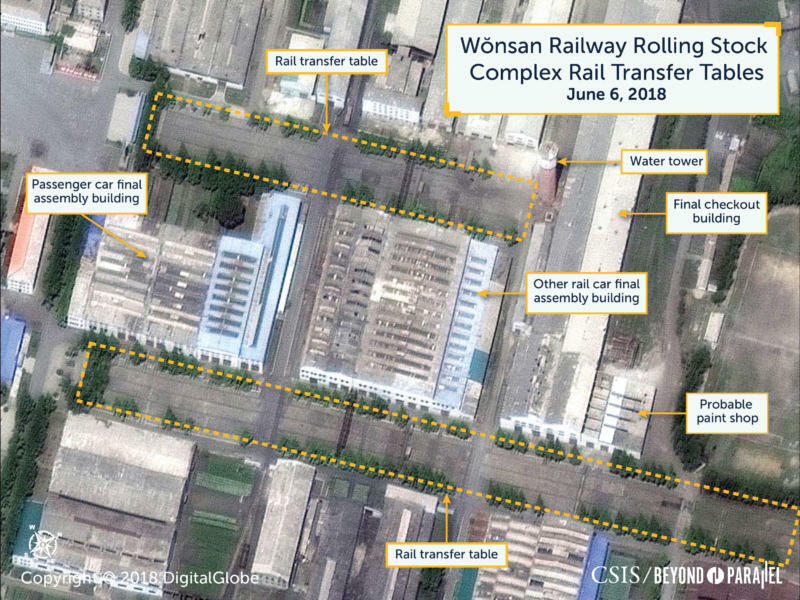 During early 2007, North Korean media reported that production “was put on a normal basis at the Wonsan Railway Rolling Stock Factory,” suggesting that the facility had finally recovered from the effects of the Arduous March. Supporting this assessment, a senior Ministry of Railways official noted, during 2009, that “the Wonsan Railway Rolling Stock Complex is increasing the production of goods wagons with emphasis placed on producing stout wagons short in length and with high side walls compared with the previous models.” Since that time, the Wonsan Railway Rolling Stock Complex has continued to be mentioned within the context of achieving success in the production and repair of rail cars including the production of a “100-ton wagon“ (presumed to be an ore car) in 2016. Source(s): 14. "Changes in Kangwon Province," Korea Today, Juche 96, No. 3, March 2007., 15. 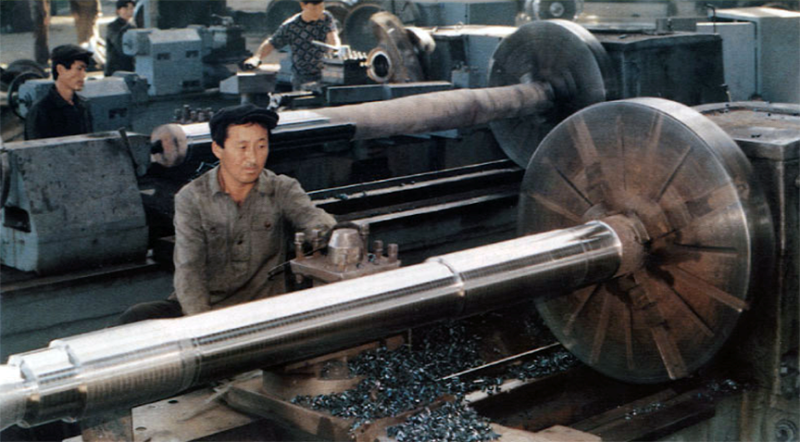 Ji Nam Il, Sim Hyon Jin, and Pang Un Hye, "Nation's Arterial Industry in Good Maintenance," Korea Today, Juche 108, No. 4, April 2009., 16. "New Heavy-duty Wagon Manufactured in DPRK," KCNA, December 1, 2016; KCTV, May 2, 2018; “Signal Successes Reported from Pilot Sectors of National Economy,” KCNA, January 17, 2011; KCBS, September 29, 2010; and KCBS, March 28, 2010. By 2005, concerted efforts of previous years appear to have finally made progress in restoring meaningful production as the North Korean magazine Ch’o’llima claims that the complex produced 200 to 300 new trains and freight cars that year—undoubtedly an inflated number. Possibly as a reflection of the improving output from the 4 June Rolling Stock Factory, sometime between 2005-2006 the facility was renamed the Wonsan Railway Rolling Stock Complex. Source(s): 17. Ch’o’llima, No. 4, April 5, 2005, 33. 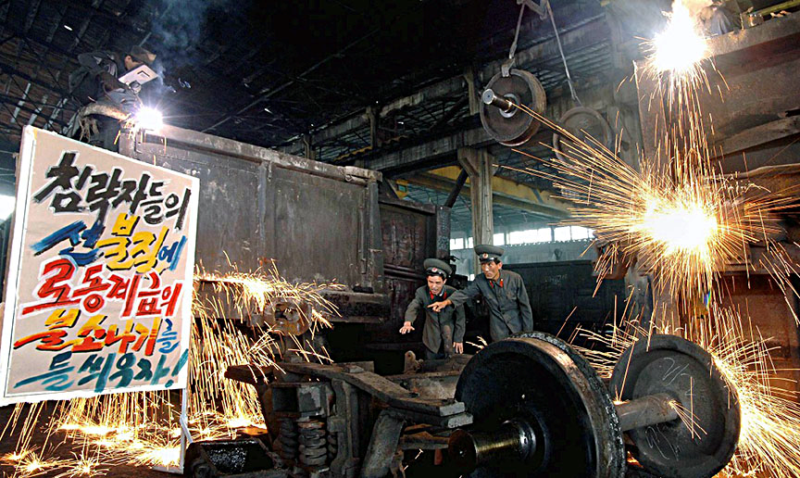 During 2000, as a reflection of North Korea’s industries struggling to overcome the effects of the Arduous March, “15 April Technical Innovation Shock Brigade” campaigns were conducted at numerous large complexes including the 4 June Rolling Stock Complex. Source(s): Picture - Inside a metal working shop at the Wonsan Railway Rolling Stock Complex showing what appear to be axles for railcar trucks being turned are large laths. (Korea, January 2003), 18. Korean Central Broadcasting Network, December 2, 2000., 19. KCTV, November 26, 2002, and KCTV, October 24, 2002., 20. Yi Chu-kyong, "Setting and Propagating Examples at the Ministry of Labor," Minju Choson, November 19, 2003, 1., 21. "Let Us Develop the Railway Transportation Work in Line with the Demands of the Developments of Reality," Nodong Sinmun, April 5, 2003, 1. During the 1990s, however, like almost all North Korean industries the 4 June Rolling Stock Complex suffered a severe decline in production output as a result of the 1991 collapse of the Soviet Union that resulted in the subsequent financial collapse of North Korea. During the 1990s, however, like almost all North Korean industries the 4 June Rolling Stock Complex suffered a severe decline in production output as a result of the 1991 collapse of the Soviet Union that resulted in the subsequent financial collapse of North Korea. Following the financial collapse was a prolonged period of dramatic droughts and floods that devastated crop yields, resulting in nationwide famine that also witnessed the death of Kim Il-sung. Collectively, this period is known as the Arduous March and while it is generally agreed to have ended during 1998, the effects lasted into the 2000s. The 4 June Rolling Stock Complex appears to have received little mention in North Korean media during this period although a 1997 report states that Kim Chong-il sent his thanks to the complex for their success in repairing freight cars. 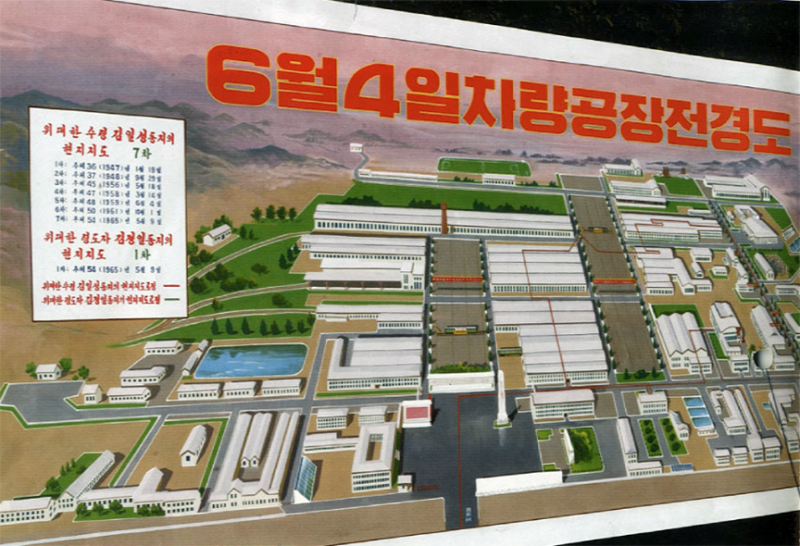 Source(s): Picture - A North Korean billboard showing the layout of the Wonsan Railway Rolling Stock Complex back when it was the 4 June Rolling Stock Works (Korea, January 2003)., 22. Korean Central Broadcasting Network, June 24, 1997. During the 1970s, however, a major expansion took place of the east side of the facility with the addition of an assembly hall, fabrication hall, foundry building, and support facilities as seen in a September 1980 declassified satellite image. This expansion may have resulted from the December 1977 Supreme People’s Assembly when Kim Il-song established strategic direction and guidelines for railway development and railcar production. 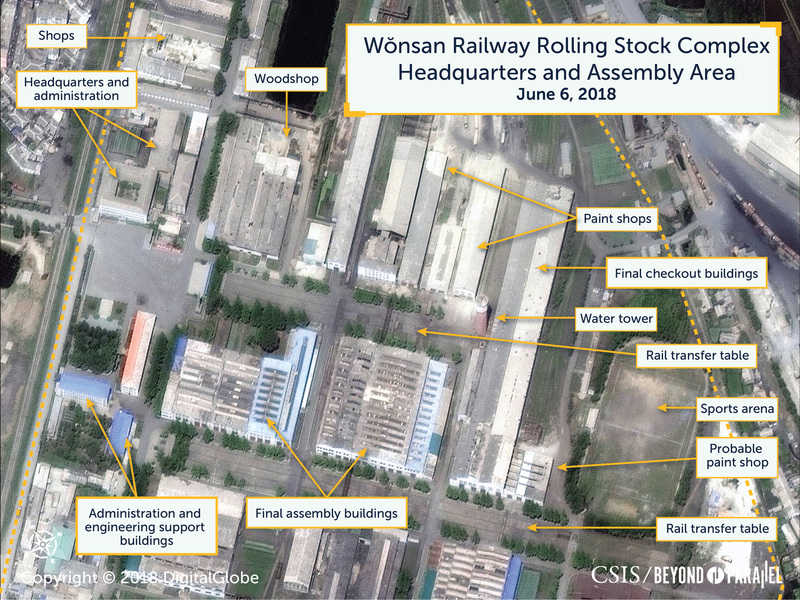 Although it is presently unclear, this expansion may have also resulted in the renaming of the Wonsan Railroad Factory to the 4 June Rolling Stock Works. Production at the complex likely grew during the late-1970s and through the 1980s. Reflecting the relatively good times of the 1980s, and a very inflated dose of propaganda, the official guide to Kangwon Province, published in 1990, claimed that the complex could produce 5,000 freight cars annually. Source(s): Picture - A declassified KH-9 mapping camera image of the then 4 June Rolling Stock Works taken on September 30, 1980 showing the expansion on the east side of the facility. (CIA), 23. “The Significance and Implications of the North-South Railway Linkage Project,” 27-95., 24. Complete Book of Korean Geography - Kangwon Province (Pyongyang), 1990, 442. Following the Korean War, one of the first areas for reconstruction was the rail network throughout the nation including, once again, the Wonsan Railroad Factory, which was rebuilt with Polish assistance. Following the Korean War, one of the first areas for reconstruction was the rail network throughout the nation including, once again, the Wonsan Railroad Factory, which was rebuilt with Polish assistance. The facility first became operational in 1957 and construction was completed during the mid-1960s. 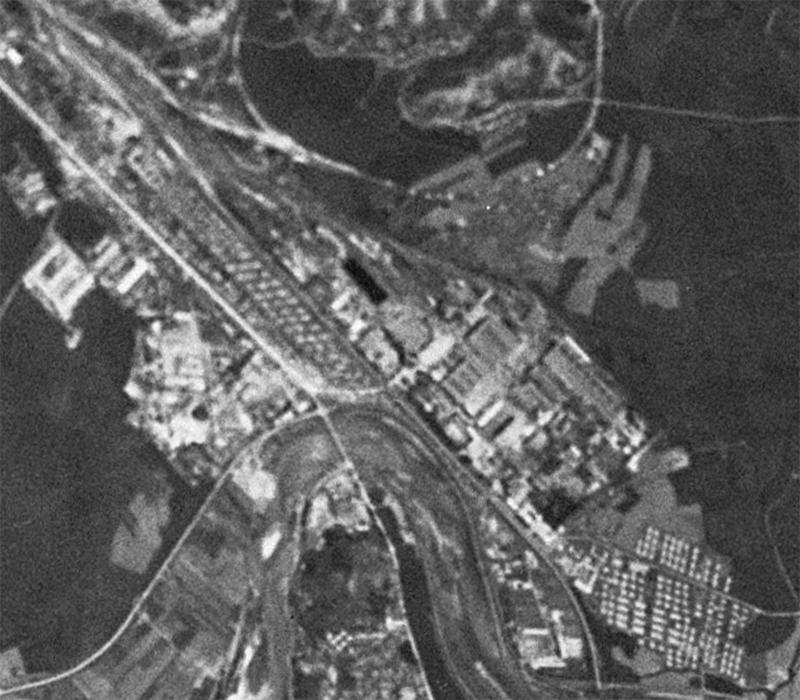 The composition of the Wonsan Railroad Factory underwent several minor infrastructure changes during the 1960s and early 1970s as indicated by declassified KH-4A image and reports. For example, between November 1967 and October 1969, the facility was extended on the north side to accommodate construction of a holding yard. As with the Chongjin Railway Factory, the first significant railroad activity in the Wonsan area occurred during the colonial period as part of the Japanese development of military facilities (naval base, airfield, etc.) and a broader economic effort to construct a rail network throughout Korea to support mining and industrial development. Track was laid from Wonsan (called Genzan at the time by the Japanese) north along the coast through Chongjin (called Seishin at the time by the Japanese) to Hoeryong in the north. Within Wonsan a range of railroad facilities were constructed to support this rail line and service the port facilities. Among these facilities was the KaIma Railroad Plant built by the Japanese in the early 1940s immediately south of the city. 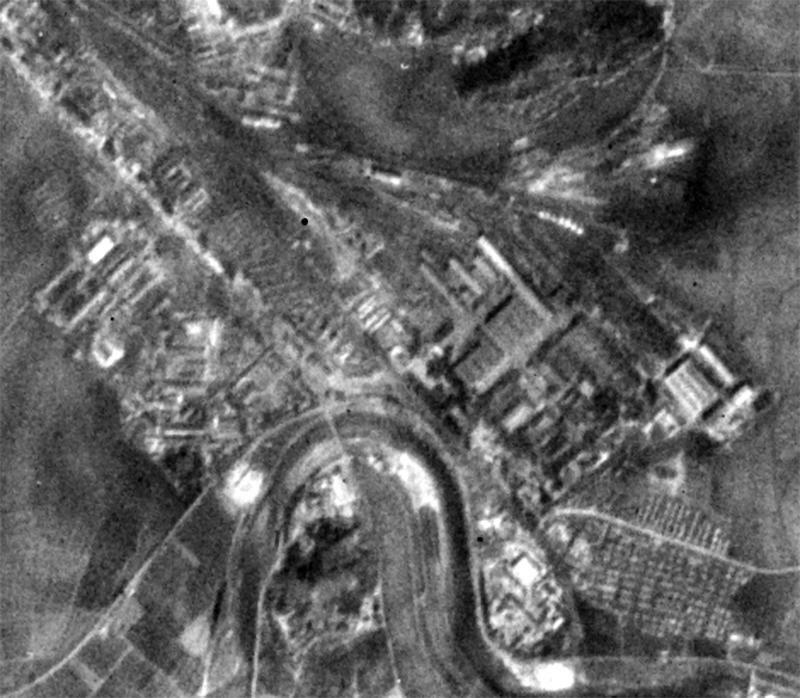 During the Korean War, Wonsan, including the Wonsan Railroad Factory, was heavily damaged by United Nations Command air strikes. With the signing of the Armistice Agreement in 1953, North Korea undertook reconstruction efforts with assistance from China, the Soviet Union, and other communist countries. 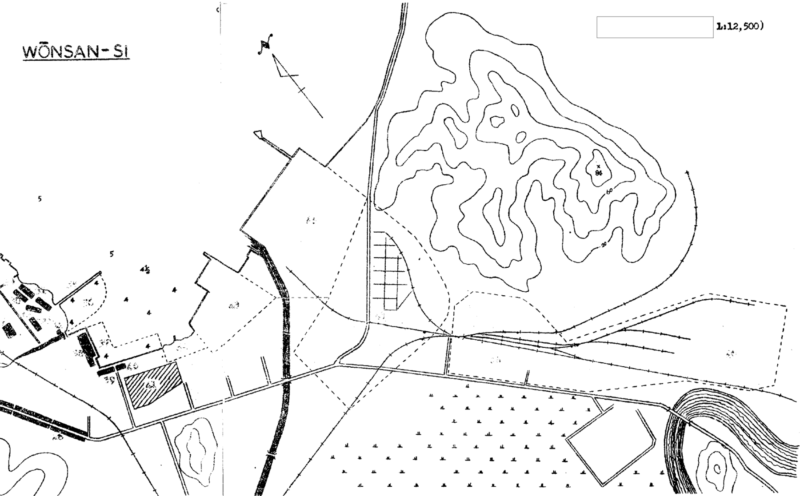 Source(s): Picture - A declassified map from 1956 of the Wonsan area showing the general location of the Wonsan Railroad Factory and Kalm Rail Station. (CIA), 28. Central Intelligence Agency, "Wonsan Railroad Car Manufacturing and Rolling Stock Repair Plant," June 1971., 29. KCNA, January 19, 2007. 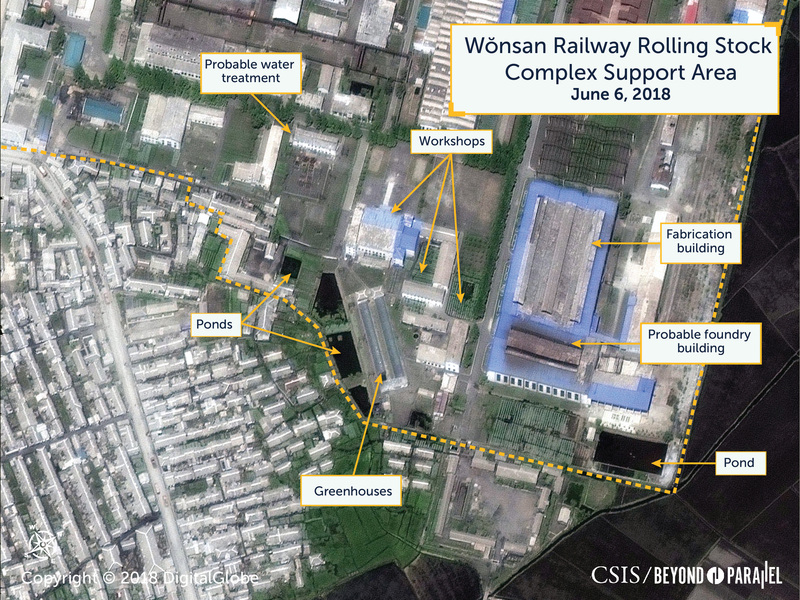 This is a follow-up report on North Korea's major railway facilities. See related report on Chongjin Railcar Factory. If, going forward, the April 27 inter-Korea agreement is substantially executed and rapprochement leads to new opportunities for infrastructure development assistance to North Korea, activity around Wonsan is likely to provide an early and leading indicator of change given its role both in the eastern transportation corridor and the national economy. Furthermore, evidence of high-level visits to the site would be a significant sign of heightened priority being given by North Korean leadership to transportation infrastructure development and improvements. High-level visits to the Wonsan Railway Rolling Stock Complex by Kim Jong-un or other high-level officials. High-level visits by delegations from China, Russia, South Korea, or international financial institutions. Progress being made in inter-Korean efforts toward the connection and modernization of other parts of the railway network in the eastern transportation corridor. Improvements underway at any of Wonsan Railway Rolling Stock Complex’s four sister facilities.